CIA + EBOLA = HELP JUSTIFY USA MILITARY TROOPS IN WEST AFRICA TO PREVENT DEMOCRACY IN THE REGION = PROTECT MULTINATIONAL EXPLOITATION OF GOLD AND USE OF SLAVERY IN WEST AFRICA | Concise Politics -- Your Time should NOT be wasted. 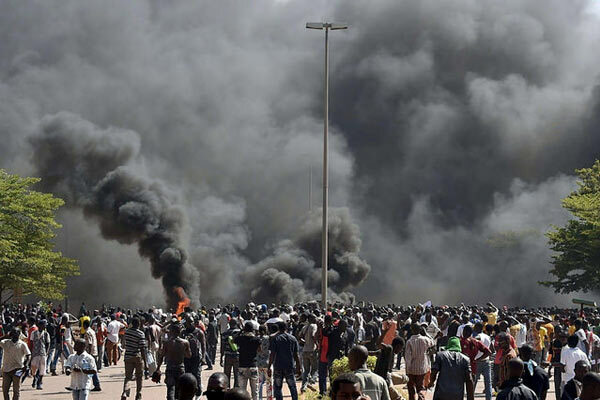 USA PUPPET = Longtime Burkina Faso president Blaise Compaoré resigned under public pressure and fled to neighboring Cote d’Ivoire = Ended 27 YEAR rule as Hundreds of thousands of Burkinabes took to the streets for democratic REFORMS. Burkina Faso = Africa’s fourth-largest producer of gold = MULTINATIONAL SCAMMERS EXPLOIT lucrative opportunities. The country’s DEMOCRATIC political opposition has been mobilizing for months. But THE DICTATOR’S loyalists in the military plan to seize back power in the midst of the ongoing unrest = Will MURDER democratic elected civilian government. = BUT LIKE EGYPT (MILITARY COUP) the military promises to turn over power quickly, but REFUSED a two-week deadline imposed by the African Union under threat of sanctions. Will a democratic transition happen or is this merely a traditional military coup d’état DICTATORSHIP that DOMINATED Burkina Faso since its independence in 1960. USA LOST A PUPPET DICTATOR JUST LIKE THEY DID IN EGYPT, but soon USA OVERTHREW the NEW democratically elected government in yet another COUP that restored MILITARY DICTATORSHIP IN EGYPT AS ISRAEL DEMANDED. Will USA support a NEW DEMOCRACY or REVERT BACK TO DICTATORSHIP to protect MULTINATIONAL CORPORATE EXPLOITATION? = SAFE for CAPITALIST EXPLOITATION Investment Opportunities. SAD FACT: A US-trained military officer now runs Burkina Faso. USA LOVES DICTATOR PUPPETS TO PROTECT CORPORATE EXPLOITATION = Will USA pressing the military to step down? 2011 Unrest began within the army and spread among the populace and opposition parties, but protests fizzled out after Compaoré reshuffled the government. 2014 Oct 30 Parliamentarians were to vote on the DICTATOR’S plan = Triggered MASSIVE popular anger with hundreds of people setting cars ablaze, storming the National Assembly, overpowering security forces, attacking the national TV HQs, Torching Parliament, and Setting fire to the ruling party’s HQ. = The vote was called off and Parliament was dissolved. FACT: Burkina Faso’s Constitution calls for the president of the senate to take power after the president resigns + Elections within 90 days. SAD FACT: Gen. Honoré Traoré, the chief of staff of the armed forces, TOOK OVER AS DICTATOR and blocked the Constitutional requirements. THEN shortly thereafter, Lieut. Col. Isaac Zida declared himself leader with the backing of the Burkinabe military. = Three heads of state within two days AFTER 27 years of rule by just one man. Who knows who rules now. MANY may wage a revolt against the Zida-led government opening up a possible prolonged power struggle within the army and could undermine stability and democratization. Protesters called for Saran Sérémé, the leader of the Party for Democracy and Change, to become the next president. Military DICTATORSHIP = Violent Crack-Down on DEMOCRACY protesters MURDERING ONE Demonstrator. US State Department = Supposedly Called “on the military to immediately transfer power to civilian authorities” and urged “civilian leadership to be guided by the spirit of the constitution of Burkina Faso and to move immediately towards free and fair presidential elections.” LIKE THEY DID IN EGYPT until Hillary Visited and soon FOLLOWED THE MILITARY COUP. Zida claims the military CONTROL to prevent “anarchy” saying, “I salute the memory of the martyrs of this uprising and bow to the sacrifices made by our people.” BUT THE MILITARY ALWAYS TRY TO BECOME DICTATORS. 2014 Nov 5 Presidents of Ghana, Nigeria and Senegal mediated talks in Ouagadougou among Burkina Faso’s military, politicians and civil society groups and the parties agreed to a transitional government holding power for one year before elections in November 2015 — NEVER decided who would LEAD during the one Year TRANSITION. USA + FRANCE = Burkina Faso’s former colonial rulers seized power in the 1987 coup and THE DICTATOR aligned with Western superpowers with both French military bases and a US spying network + USA counterterrorism operations against Islamist militias. Zida himself received training from the US military. USA + WESTERN MULTINATIONALS = Exploitation of the NATION’S GOLD AND RESOUCRE wealth has DONE NOTHING for ordinary Burkinabes – USED AS SLAVES = 50% Live below the poverty line with high infant mortality and low literacy. RANKS near the bottom of the UN’s Human Development Index. = Key driver of the protests that TOPPLED their USA PUPPET DICTATOR. PRE-1987 The revolutionary Sankara aligned against France and USA to implement aggressive land reforms and redistribute wealth to the people = Policies. 1987 COUP KILLED Thomas Sankara, People oriented leader against FRENCH AND USA Colonialism, and brought THE 27 YEAR USA PUPPET DICTATOR TO POWER who implemented and embraced neoliberalism and reversed Sankara’s reforms. HATE OF USA NEOLIBERAL IMPERIALISM = Sankara’s brand of anti-imperialism remains an ideal for many West Africans who envision a future in which the region becomes more economically and politically independent of the West. = Currents that could bring in democratic governments putting power for a angry population over EXTREME inequality = THESE CURRENTS threaten Western MULTINATIONAL EXPLOITATION FOR GOLD AND SLAVERY WAGES. Burkina Faso UNLIKE Egypt HATES THE MILITARY DICTATORS = NO SUPPORT OF THE MILITARY. In the absence of a democratic transition, protests will continue indefinitely – HENCE USA TROOPS SENT IN USING EXCUSE OF A WESTERN MANUFACTURED EBOLA CRISIS. USA + FRANCE will verbally endorse a democratic revolution, BUT WILL TRY TO IMPOSE A MILITARY DICTATORSHIP on the SLAVE WAGE POPULATION. USA VERBAL BULL CHIOT = The State Department’s support for “free and fair presidential elections” in the country will be tested. This entry was posted in CIA + EBOLA = HELP JUSTIFY USA MILITARY TROOPS IN WEST AFRICA TO PREVENT DEMOCRACY IN THE REGION = PROTECT MULTINATIONAL EXPLOITATION OF GOLD AND USE OF SLAVERY IN WEST AFRICA and tagged CIA + EBOLA = HELP JUSTIFY USA MILITARY TROOPS IN WEST AFRICA TO PREVENT DEMOCRACY IN THE REGION = PROTECT MULTINATIONAL EXPLOITATION OF GOLD AND USE OF SLAVERY IN WEST AFRICA. Bookmark the permalink.